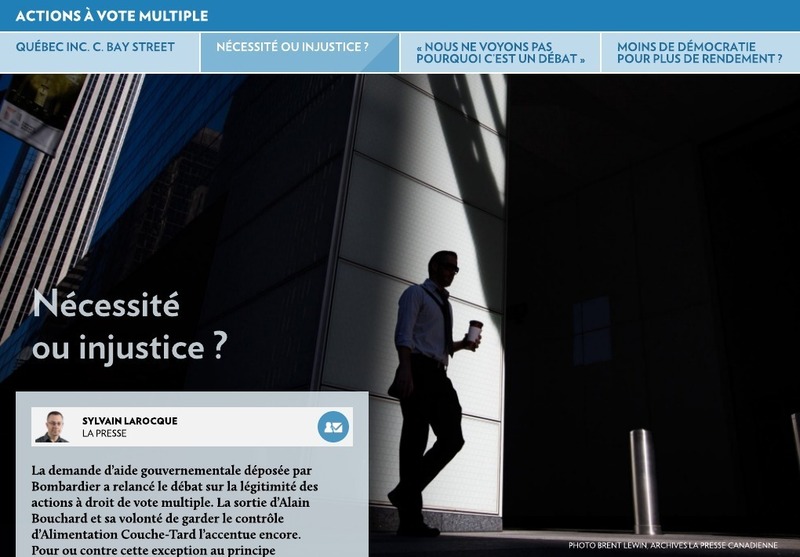 Voici un excellent article de Blair A. Nicholas*, publié aujourd’hui, sur le site de Harvard Law School Forum on Corporate Governance, qui aborde un sujet bien d’actualité, et très controversé : le futur de la gouvernance dans le contexte d’émission d’actions à droit de vote multiple. L’auteur présente l’historique de ce mouvement, montre les failles attribuables à ce genre de structure de capital, et suggère certains moyens pour contrer les lacunes observées dans le domaine de la gouvernance. Également, ce type d’arrangement est l’apanage de plusieurs entreprises québécoises qui cherchent à maintenir le pouvoir entre les mains des familles entrepreneuriales : Bombardier, Groupe Jean Coutu, Alimentation Couche-Tard, Power Corporation, etc. Est-ce dans « l’intérêt supérieur » de la société québécoise ? Selon Blair, les études montrent que les entreprises à droit de vote multiple ont des performances inférieures, et que leur structure de gouvernance est plus faible. Academic studies also reveal that dual-class structures underperform the market and have weaker corporate governance structures. For instance, a 2012 study funded by the Investor Responsibility Research Center Institute, and conducted by Institutional Shareholder Services Inc., found that controlled firms with multi-class capital structures not only underperform financially, but also have more material weaknesses in accounting controls and are riskier in terms of volatility. The study concluded that multi-class firms underperformed even other controlled companies, noting that the average 10-year shareholder return for controlled companies with multi-class structures was 7.52%, compared to 9.76% for non-controlled companies, and 14.26% for controlled companies with a single share class. A follow-up 2016 study reaffirmed these findings, noting that multi-class companies have weaker corporate governance and higher CEO pay. On pourrait dire que « quand ça va mal dans ce genre d’entreprise, on dirait que rien ne va bien ! » L’exemple de Hollinger est éloquent à cet égard. Par contre, « quand ça va bien, on dirait qu’il n’y a rien qui va mal ! » Ici, l’exemple de Couche-Tard est approprié. Quelle est votre opinion sur ce sujet ? Recent developments and uncertainties in the securities markets are drawing institutional investors’ attention back to core principles of corporate governance. As investors strive for yield in this post-Great Recession, low interest rate environment, large technology companies’ valuations climb amid the promises of rapid growth. But at the same time, some of these successful companies are asking investors to give up what most regard as a fundamental right of ownership: the right to vote. Companies in the technology sector and elsewhere are increasingly issuing two classes or even three classes of stock with disparate voting rights in order to give certain executives and founders outsized voting power. By issuing stock with 1/10th the voting power of the executives’ or founders’ stock, or with no voting power at all, these companies create a bulwark for managerial entrenchment. Amid ample evidence that such skewed voting structures lead to reduced returns long run, many public pension funds and other institutional investors are standing up against this trend. But in the current environment of permissive exchange rules allowing for such dual-class or multi-class stock, there is still more that investors can do to protect their fundamental voting rights. The problem of dual-class stock is not new. In the 1920s, many companies went public with dual-class share structures that limited “common” shareholders’ voting rights. But after the Great Depression, the NYSE—the dominant exchange at the time—adopted a “one share, one vote” rule that guided our national securities markets for decades. It was only in the corporate takeover era of the 1980s that dual-class stock mounted a comeback, with executives receiving stock that gave them voting power far in excess of their actual ownership stake. Defense-minded corporate executives left, or threatened to leave, the NYSE for the NASDAQ’s or the American Exchange’s rules, which permitted dual-class stock. In a race to the bottom, the NYSE suspended enforcement of its one share, one vote rule in 1984. While numerous companies have since adopted or retained dual-class structures, they remain definitively in the minority. Prominent among such outliers are large media companies that perpetuate the managerial oversight of a particular family or a dynastic editorial position, such as The New YorkTimes, CBS, Clear Channel, Viacom, and News Corp.
Now, corporate distributions of non-voting shares are on the rise, particularly among emerging technology companies. They have also been met with strong resistance from influential institutional investors. In 2012, Google—which already protected its founders through Class B shares that had ten times the voting power of Class A shares—moved to dilute further the voting rights of Class A shareholders by issuing to them third-tier Class C shares with no voting rights as “dividends.” Shareholders, led by a Massachusetts pension fund, filed suit, alleging that executives had breached their fiduciary duty by sticking investors with less valuable non-voting shares. On the eve of trial, the parties agreed to settle the case by letting the market decide the value of lost voting rights. When the non-voting shares ended up trading at a material discount to the original Class A shares, Google was forced to pay over $560 million to the plaintiff investors for their lost voting rights. Facebook followed suit in early 2016 with a similar post-IPO plan to distribute non-voting shares and solidify founder and CEO Mark Zuckerberg’s control. Amid renewed investor outcry, the pension fund Sjunde AP-Fonden and numerous index funds filed a suit alleging breach of fiduciary duty. Also in 2016, Barry Diller and IAC/InterActive Corp. tried a similar gambit, creating a new, non-voting class of stock in order to cement the control of Diller and his family over the business despite the fact that they owned less than 8% of the company’s stock. The California Public Employees Retirement System (CalPERS), which manages the largest public pension fund in the United States, filed suit in late 2016. Both suits are currently pending. Institutional investors such as CalSTRS are increasingly voicing opposition to IPOs promoting outsized executive and founder control. In 2016, the Council for Institutional Investors (“CII”) called for an end to dual-class IPOs. The Investor Stewardship Group, a collective of some of the largest U.S.-based institutional investors and global asset managers, including BlackRock, CalSTRS, the Vanguard Group, T. Rowe Price, and State Street Global Advisors, launched a stewardship code for the U.S. market in January, 2017. The code (discussed on the Forum here), called the Framework for Promoting Long-Term Value Creation for U.S. Companies, focuses explicitly on long-term value creation and states as core Corporate Governance Principle 2 that “shareholders should be entitled to voting rights in proportion to their economic interest.” Proxy advisory firm, Institutional Shareholder Services Inc., has also voiced strong opposition to dual-class structures. The Snap IPO in particular has elicited investors’ rebuke. After Snap announced its intended issuance of non-voting stock, CII sent a letter to Snap’s executives, co-signed by 18 institutional investors, urging them to abandon their plan to “deny outside shareholders any voice in the company.” The letter noted that a single-class voting structure “is associated with stronger long-term performance, and mechanisms for accountability to owners,” and that when CII was formed over thirty years ago, “the very first policy adopted was the principle of one share, one vote.” Anne Simpson, Investment Director at CalPERS, has strongly criticized Snap’s non-voting share model, stating: “Ceding power without accountability is very troubling. I think you have to relabel this junk equity. Buyer beware.” Investors have also called for stock index providers to bar Snap’s shares from becoming part of major indices due to its non-voting shares. By keeping index fund investors’ cash out of such companies’ stock, such efforts could help provide concrete penalties for companies seeking to go to market with non-voting shares. There are many compelling reasons why institutional investors strongly oppose dual-class stock structures that separate voting rights from cash-flow rights. In addition to the immediate deprivation of investors’ voting rights, there is ample evidence that giving select shareholders control, that is far out of line with their ownership stakes, reduces company value. Such structures reduce oversight by, and accountability to, the actual majority owners of the company. They hamper the ability of boards of directors to execute their fiduciary duties to shareholders. And they can incentivize managers to act in their own interests, instead of acting in the interest of the company’s owners. Hollinger International, a large international newspaper publisher now known as Sun-Times Media Group, is a striking example. Although former CEO, Conrad Black, owned just 30% of the firm’s equity, he controlled all of the company’s Class B shares, giving him an overwhelming 73% of the voting power. He filled the board with friends, then used the company for personal ends, siphoning off company funds through a variety of fees and dividends. Restrained by the dual-class stock structure, Hollinger stockholders at-large were essentially powerless to rein in such actions. Ultimately, the public also paid the price for the mismanagement, footing the bill to incarcerate Black for over three years after he was convicted of fraud. This is a classic example of dual-class shares leading to misalignment between management’s actions and most owners’ interests. The typical retort from proponents of dual-class structures is that depriving most investors of equal voting rights allows managers the leeway to make forward-thinking decisions that cause short-term pain for overall long-term gain. This assertion, however, ignores that many investors—and in particular public pension funds and other long-term institutional investors—are themselves focused on long-term gains. If managers have good ideas for long-term investments, such prominent investors will likely support them. Proponents of dual-class structures also argue that investors who prize voting power can simply take the “Wall Street Walk,” selling shares of companies that resemble dictatorships while retaining shares of companies with a more democratic voting structure. That is often easier said than done. For instance, passively managed funds may not be able to simply sell individual companies’ stock at will. Structural safeguards such as equal voting rights should ensure investors’ ability to guide and correct management productively as events unfold. If the only solution is for investors to abandon certain investments after dual-class systems have done their damage, owners lose out financially and discussions in corporate boardrooms and C-suites across the country will suffer from a lack of diversity, perspective, and accountability. Ultimately, arguments regarding investor choice also ignore that failures in corporate governance can impose costs not only on corporate shareholders, but also on society at large. When dual-class stock structures prevent boards and individual shareholders from effectively monitoring corporate executives, that monitoring function can be exported to third parties, including the courts and government regulators. Regulators may need to step up disclosure provisions to ensure transparency of such controlled companies, and courts may be called upon to remedy the behavior of unchecked executives. In the monitoring and in the clean-up, the externalities placed upon outsiders make corporate voting rights an issue of public policy. As the trend of issuing dual-class or multi-class stock continues, institutional investors should remain vigilant to protect shareholders’ voting rights. Pre-IPO investors can oppose the issuance of non-voting shares during IPOs. Investors in publicly traded companies can speak out against proposed changes to share structures or resort to litigation when necessary, such as in the Google, Facebook, and IAC cases. Institutional investors may also lobby Congress, regulators, and the national exchanges to revive the traditional ban on non-voting shares or make it harder to issue no-vote shares. For instance, in the wake of the Snap IPO, CII Executive Director Ken Bertsch and other investors met with the SEC Investor Advisory Committee. They encouraged the SEC to work with U.S.-based exchanges to (1) bar future no-vote share classes; (2) require sunset provisions for differential common stock voting rights; and (3) consider enhanced board requirements for dual-class companies in order to discourage rubber-stamp boards. Whether by working with regulators, securities exchanges, index providers, or corporate boards, institutional investors that continue to fight for shareholder voting rights will be working to promote open and responsive capital markets, and the long-term value creation that comes with them. *Blair A. Nicholas is a partner and Brandon Marsh is senior counsel at Bernstein Litowitz Berger & Grossmann LLP. This post is based on a Bernstein Litowitz publication by Mr. Nicholas and Mr. Marsh. Related research from the Program on Corporate Governance includes The Untenable Case for Perpetual Dual-Class Stock by Lucian Bebchuk and Kobi Kastiel (discussed on the Forum here).